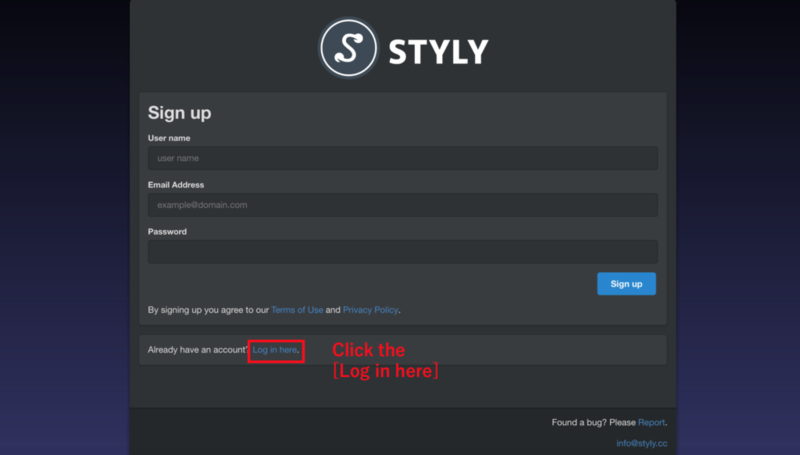 This article introduces how to create a new account of STYLY, how to login and the way to use a home screen of WebEditor in order to create a VR space. When you create an account, the screen will be shifted to the home screen of the WebEditor. In the home screen of the WebEditor, you can start the WebEditor and change the account information. Let’s create a STYLY account. 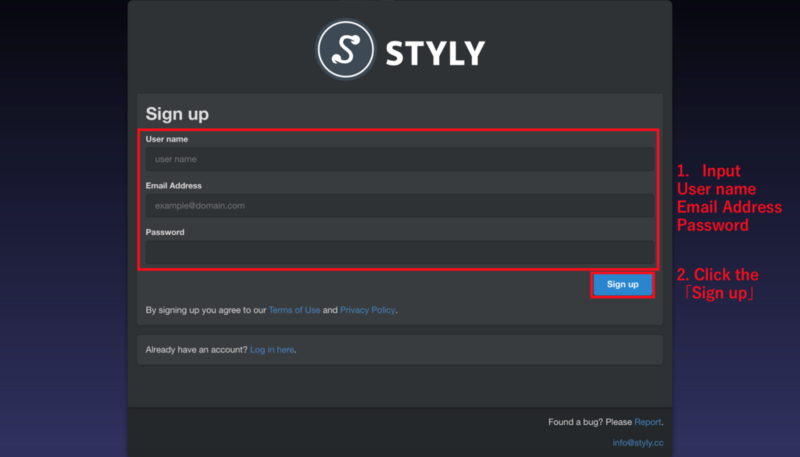 If you have already created the account, see how to login STYLY. You can create an account easily by resistering a screen name, an email address and a password. Firstly, access STYLY. 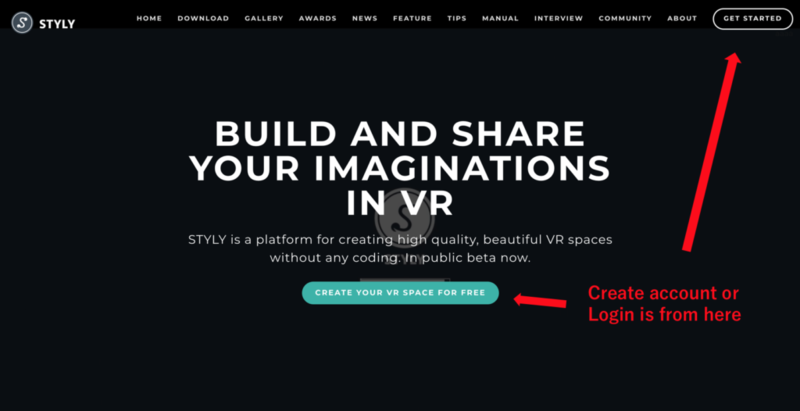 Then, a login page or create an account page will appear when you click a [CREATE YOUR VR SPACE FOR FREE] button or a [GET STARTED] button. This is the ‘create an account’ screen, you see the “Sign up” on the upper-left side of the screen. Input the information to each blank. Create an account will be completed after inputting the information above and click a [Sign up] button. User name Creator’s name. It will be included in URL when you publish a scene. ※It can’t be changed once regestered. You can change it at WebEditor page after registering. info@styly.cc For inquiries, please send emails to info@styly.cc. After creating an account or a user already has one, click the[Log in here] button in the Sign up screen to move to login page. Input the email address and the password then click [Log in] button you can move to WebEditor home screen. This section will introduce how to start the WebEditor, how to confirm/modify the account and how to confirm API key. The how to confirm/modify the account section will introduce how to resister a Full name and Company name(optional), modify email address and change the password. The WebEditor is an editor which enables to create a VR space called “Scene” on the website. This is the WebEditor page. You can start the WebEditor from a [Home] screen. Let’s start the WebEditor by clicking a [Launch STYLY Editor] button. Let’s create and publish your own VR space when you start the WebEditor by referring to a tutorial which tells you how to create and publish the scene. In the Profile page, you can confirm a Screen Name, resister/renew the Full name and Company name. To resister the Full name and Company name is optional. Let’s resister the Full name and the Company name. There are forms for First name and Last name. Write your First name in the First name form and write the Last name in the Last name form. Then, Input the Company name in the company name form. You can renew the Profile by clicking a[Update] button after inputting the information. In the account page, you can modify the email address and the password. First, introduce how to modify the email address. Input the new mail address in the new email address form and click the [Confirm] button. The email address will be modified. Second, introduce how to change the password. Input the old password at the Current Password form. Then, input a new password at the New Password form. Also, input a new password at the New Password[Confirm] form again. Finally, click the [Change] button. Introduce how to confirm API key. API key is the alphanumeric character shown in a gray colored form. API key will be used when you upload prefab and so on from Unity to STYLY. API key will be reset when you click the [Reset] button. For details of Unity plugin for STYLY, click here(under preparation). That’s all for the introductions. Let’s start the WebEditor. Then, publish your own VR scene in the world by referring to the tutorial which tells you how to publish and create a Scene.